“One size does not fit all,” writes Emily Zirimis of Man Repeller. When it comes to fashion, this couldn’t be truer. We all have different body shapes, and thanks to vanity sizing, shopping for clothes isn’t the easiest—especially if you’re looking for plus-size options. While many brands are coming around to offering a wider range of sizes, as one writer explains, it is still hard to shop for clothes in the plus-size category that aren’t simple basics. So what’s a fashion girl to do when her favorite high-street brands don’t offer her size? While Zirimis may have the answer, she wants everyone to know that some plus-size girls love fashion too—and dressing the part. It’s just hard. “You may not realize it because I’m not wearing it, but being plus size doesn’t mean that I don’t have an eye for fashion. For color, for taste, for design, for strange necklines and jeans that flare out and tatter at the bottom,” she says. As a follow-up, the passionate fashion lover teamed up with fellow Man Repeller staffer Amelia Diamond to curate some of the most stylish outfits we’ve seen, each demonstrating some serious plus-size styling power. Keep scrolling to see some of our favorite outfits below and check out the full photo shoot on Man Repeller. Shop the Look: Hart Hagerty Tassel Earrings ($48); Beth Ditto Embroidered Jacket ($95); Alice & You Shirt Dress ($32); Nancy Gonzalez bag; Eloquii trousers; Brother Vellies sandals. Shop the Look: Dolce & Gabbana Sunglasses ($780); ASOS Sequin Sweater ($105); ASOS Curve Striped Shirt ($46) and Kimmi Boyfriend Jeans ($52); MarK Cross Grace Mini Box Bag ($2095); Trademark Paloma Mules ($298). Shop the Look: Karen Walker glasses; Violeta by Mango striped top; Eloquii Faux Leather Skirt ($90); Tibi Charlie Slides ($395). Which outfit is your favorite? 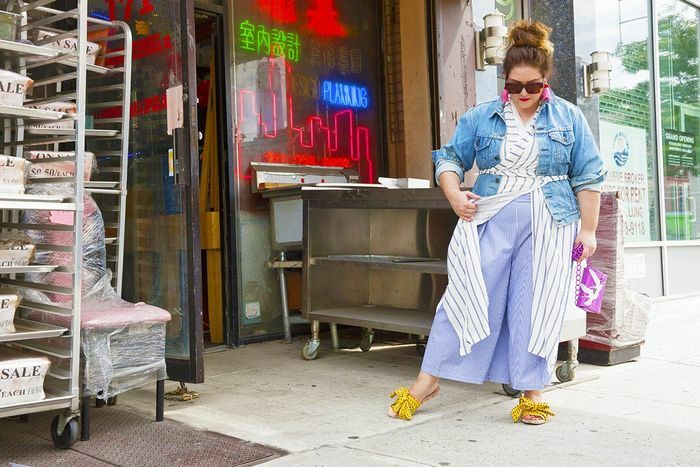 Tell us in the comments and check out more awesome plus-size outfits at Man Repeller.